Why is everyone so interested in Mid-Century Modern Architecture? With all of today’s innovation, technology and design, why are we resorting back to designs that originated more than 60 years ago. There are countless stores and websites dedicated to midcentury modern tastes and many architects and developers have embraced this style when building new homes. Mid-Century Modernism is an architectural design style that generally describes the mid-20th Century developments in modern design, architecture and urban development between the 1920s and 1980s. Many consider Frank Lloyd Wright’s principal movement of organic architecture combined with the Craftsman (Arts and Crafts) style to be the jumping off point for the aesthetics behind Mid-Century Modern Architecture. This style of architecture was frequently used in residential structures with the goal of bringing modernism into America’s post-war suburbs. The style emphasized creating structures with many large windows and with open floor plans with the intention of opening up interior spaces and bringing the outdoors in. Many Mid-Century homes utilized the groundbreaking post and beam architectural design that eliminated the need of bulky support walls in favor of walls that were seemingly made of glass. The most important part of Mid-Century designs was functionality, with an emphasis on targeting the needs of the average American family. Prominent builder and real estate developer Joseph Eichler was instrumental in bringing Mid-Century Modern architecture to the Los Angeles Area as well as to the San Francisco Bay area. Integration with nature – one of the most important aspects of Mid-Century Modern Architecture was to blend the indoors with the outdoors by offering multiple views or multiple access points from inside to the outside. This encouraged residents to appreciate being outside and promoted a healthy standard of living. Changes in elevation – it is common to see small steps that go up and down between rooms to create split-level spaces. A Mid-Century Modern home might also have partial walls or cabinets that range in height to create different depths in the space. Large windows – large glass windows, sliding glass doors and other expansive pieces of glass were used to allow light to enter the rooms from various angles. Flat planes – Mid-Century Modern homes were characterized by rigorous geometric lines. Flat and low sloping roofs are extremely common. A consistent rule of thumb in Mid-Century Modernism is to keep everything tidy and simple. Connecting the inside to the outside creates harmony and a balanced and healthy lifestyle. Old school passive design is highly sustainable. Outdoor rooms are just as important as indoor rooms. Quality of light is more important than the light fixture. Lights in Mid-Century Modern homes are tastefully concealed and bathe their surroundings with a warm and friendly glow. 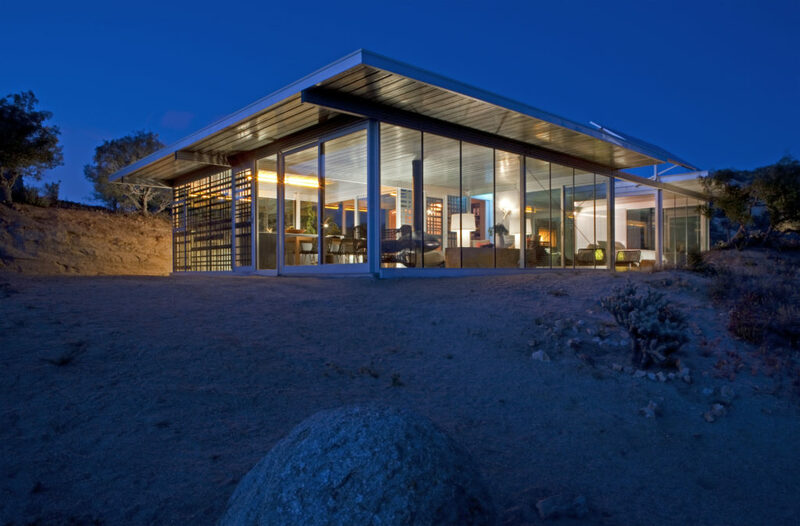 Desert Modernism is the style of architecture that evolved from Mid-Century Modernism and became extremely popular in Palm Springs. The two styles are pretty much identical and Desert Modernism evoked a lifestyle of simple elegance and informality. Influenced by the dictates of desert living and the intense climate, the style grew out of the architect’s and designer’s adaptive use of inventive materials, modern construction techniques and new technologies. The Eames House – Also known as Case Study House No. 8, the Eames House is a landmark of Mid-Century Modern Architecture located in Los Angeles. The home was one of 25 built for the Case Study House Program, which challenged architects to build homes situated for a modern lifestyle using materials made popular during World War II. Farnsworth House – Designed by Ludwig Mies Van Der Rohe in 1951, the Farnsworth House in Plano, Illinois is known for its transparency and simplicity. VLD House – Richard Neutra designed a research house in Silver Lake, California in 1933 with a loan from a Dutch philanthropist. This radical house featured rooftop and balcony gardens. Thanks for sharing idea All About Mid-Century Modern Architecture and how it is help full to know modern architecture . So please share more with us..
McMansion developers have attacked our mid-century modern neighborhood with the argument that “Nobody wants to buy a mid-century modern home; they cannot be sold.” What evidence otherwise is there? Next PostNext The Architectural and Design Center of the Palm Springs Art Museum just celebrated its first anniversary.